Wow. Are we already 19 days into the new year? I feel like I haven't posted on the blog for a long time (That's SO unlike me!). I was in London and Paris over Christmas and it has been hard to get back to a routine after the holidays. But here I am now and I have two cards to share. For the first card, I combined a little bit of print-and-cut with manual die-cutting. I love using my Silhouette Cameo for cutting out SVGs but personally, I think that the metal dies still do a better job with cutting stitched lines. In this case, I printed out the greeting and used a metal die with my Sizzix Big Shot to cut out the scallop circle with stitched lines. 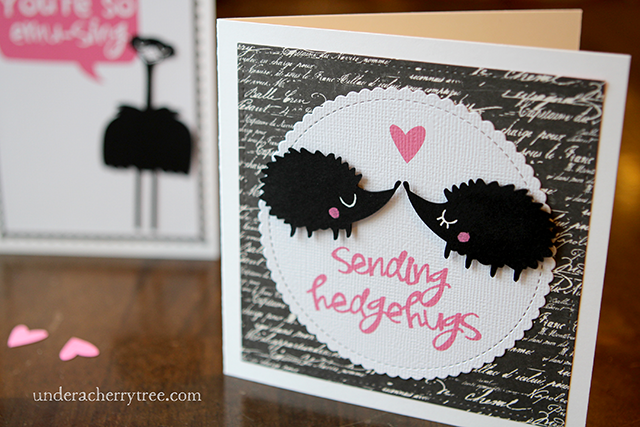 The hedgehogs were cut out using my Silhouette Cameo and I drew in the eyes and cheeks with gel pens to reduce bulk. To be honest, this second card was really just an excuse for me to use my Sizzix Big Shot. Even though I use my Cameo a lot, I never stopped buying metal dies. I'm trying to use them more often so I don't feel so guilty when I buy even more. Ha! Anyway, this card will look just as good if the whole thing was printed out. I have to say though, the layers do make the card a little more interesting given with the extra dimension. 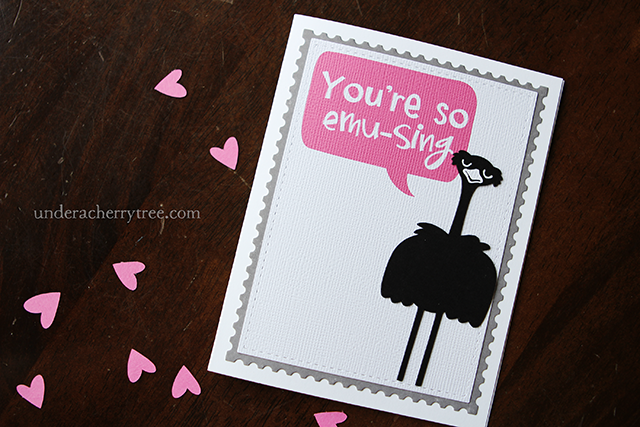 The Emu SVG was cut using my Cameo, while the two base layers were cut out using metal dies. The price will change to zero after they have been added to the cart. Hope you like these cards and don't forget to download your FREE Schmoopsie Poo Door Hanger before they are gone tonight. CLICK HERE TO GET THEM. 2016 was a little crazy- we traveled so much! We spent all Summer visiting Japan, Singapore, and Taiwan and spent the recent holiday break in London and Paris. I had initially planned on posting pictures here on the blog but decided to do so on my Instagram instead. If you have not seen the photos, I hope that you would take a peek on my Instagram. You can find my page by clicking HERE. 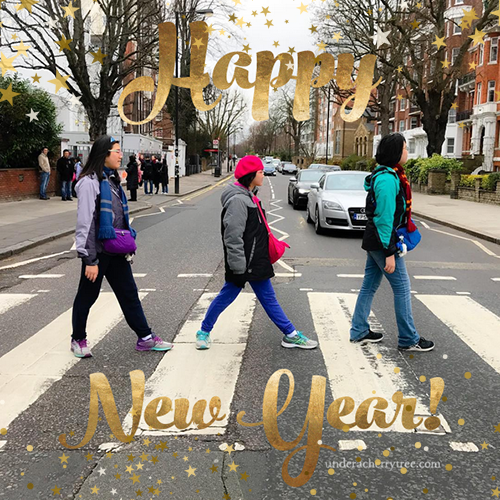 We just got home from London and I am still trying to get over the jet lag but I wanted to pop in here quickly to wish everyone a Happy New Year! May the new year bring you much happiness and good health! Here's to more crafting and less cluttering.